Archie Goodwin entered the University of Kentucky as the 12th-best recruit in the country according to Recruiting Services Consensus Index and a key component of another stellar John Calipari recruiting class. Things did not come together by any means for Kentucky, though, as the team struggled with inconsistency, maturity, and injuries, ultimately floundering to a first round exit in the NIT and a 21-12 record. Goodwin emerged as the team's leading scorer and go-to guy, but struggled with inefficiency for much of the year. Despite the stern comments he made upon being eliminated in the NIT (If any of us were saying we think we should leave, then we'd all be delusional,) and supposedly against coach John Calipari's advice, Goodwin decided not to return to Kentucky, declaring for the NBA Draft with the intent to hire an agent. Now, following a freshman season marked not only by flashes of excellence, but also by long stretches of inconsistency, Goodwin must prove to NBA front offices that he is worthy of a first round selection and is capable of contributing at the next level in the not-too-distant future. Goodwin is an excellent NBA prospect from a physical perspective, standing around 6'5 in shoes with a massive 6'10 wingspan and a developing 198-pound frame. Additionally, he is an explosive athlete around the basket, quick in both transition and off-the-dribble. Simply put, Goodwin has the physical profile of an NBA shooting guard with athleticism and length that will allow him to compensate for any height deficiencies at the next level once his frame fills out. His prospects are less sure when analyzing his performance on the offensive end of the floor. As an 18-year-old freshman, one of the youngest players in college basketball, Goodwin played a significant role for the 21-12 Wildcats, commanding a team high 27.5% (by a wide margin) of Kentucky's overall possessions and scoring a solid 17.4 points per 40 minutes pace adjusted. Furthermore, he was at his best against Kentucky's best competition, posting solid scoring numbers in early-season contests against Louisville, Duke, Baylor, and Maryland. His lack of productivity can, in part, be attributed to a prolonged slump once Kentucky reached conference play, during which he averaged 12.7 ppg and shot just 18% from beyond the arc and 57% from the free throw line, but his inconsistency amidst his significantly better run in November and December suggests that this may be more of an issue than simply hitting the freshman wall. SEC teams undoubtedly figured out how to stop Kentucky and Goodwin struggled badly under the pressure of being the only player on the roster capable of creating their own shot effectively. The scrutiny that comes along with playing at such a large program coming off a national championship may have been more than he was ready to handle at this stage of his career. Goodwin's offensive struggles begin with his inefficiency from the perimeter. According to Synergy, he makes just 33% of the 90 overall jump shots he attempted this season, while making just 27% of his three-pointers. While Goodwin started off the season fairly well, making 40% of his 3-point attempts in the non-conference portion of Kentucky's schedule, he lost his confidence midway through the season and saw his shooting mechanics break down almost entirely, dipping the ball nearly to his knees upon the catch, elevating and releasing the ball from different vantage points, looking extremely off-balance with his footwork, and thus short-arming many of his shot-attempts. Even though he does not get that much arc on his jumper, Goodwin appeared to be capable of making shots from the perimeter when taking open attempts in rhythm with full confidence. When guarded, he tends to force and rush shots, compromising his rhythm and mechanics in the process. Ultimately, even in his best moments as a shooter, the question still remains as to whether he can make perimeter jump shots from NBA range against bigger and more athletic defenders, something that will play a large role in his ability to be an efficient contributor long-term. Looking elsewhere, Goodwin already shows significantly more potential, especially operating in transition, isolation and pick-and-roll situations, which comprise the biggest share of his offensive contributions. Though he must continue to develop his ball-handling ability in half-court situations, he already shows a very good first step and the ability to get to the basket at will. Additionally, he makes 54.5% of his shots around the rim and attempts an outstanding 7.9 free throws per 40 pace adjusted, fourth best amongst NCAA shooting guards in our top-100 rankings. He still has room to improve on his ability to finish through traffic, something that could come with added strength, and he will have to show he's at least a capable shooter for defenders not to completely sag off him in the NBA. More intriguing is his ability to operate as a shot creator out of the pick-and-roll, primarily in terms of attacking and creating good looks around the basket. Though he never lived up to his billing as a potential combo guard, he did emerge as a solid, albeit limited, distributor as a freshman. Along these lines, his 3.3 assists per 40 minutes pace adjusted and 3.8 turnovers show both the good and the bad. Goodwin shows excellent potential on the defensive end - guarding three positions at the collegiate level - primarily due to his good lateral quickness and excellent length. Consistency and focus are significant issues for him at times, as they are for many freshman wings, but that he does show the ability to fight through screens and stay involved after he has been beaten speaks well to his prospects. He was, by far, Kentucky's best perimeter defender as a freshman, and scouts will be evaluating his ability to consistently stay in front of NBA-caliber shooting guards throughout the pre-draft process. While Goodwin presents quite a few weaknesses to scouts, it's hard not to be intrigued the potential he brings to the table as an NBA prospect. Between his ability to get his own shot around the basket, his well above average physical profile, and his upside as a defender, Goodwin looks the part and already does a few things that NBA teams value highly in young players. That being said, his extreme youth, average fundamentals, inconsistency, and lack of comfort as a jump shooter will likely prevent him from contributing right away, making him more of a project than some expected him to be coming out of high school. Additionally, NBA scouts will want to do their due diligence surrounding his strange departure from Kentucky. At the end of the day, however, Goodwin shows a good amount of promise for an 18-year-old freshman. His draft prospects are far from sure at this point, but he has every opportunity to solidify himself as a first round pick with solid showings in pre-draft settings, and could certainly emerge as a steal later on in his career if a team is willing to be patient with his development. 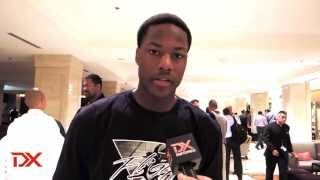 One of the top ranked shooting guard prospects in the 2012 high school class, Archie Goodwin did little to diminish his standing with his performances at the McDonald's All-American and Nike Hoop Summit practices and games over the past two weeks. Measuring 6-5 in shoes, with an outstanding 6-10 wingspan, a frame that should carry as much weight as needed, and very good athleticism, Goodwin is blessed with excellent physical attributes. Goodwin is an aggressive, instinctive scorer, outstanding in transition and extremely assertive in the half-court. He has a strong first step and a nose for getting inside the paint, being capable of creating his own shot on a regular basis, mostly to take the ball strong to the basket. Once inside the paint, he can finish in highlight reel fashion, showing good body control, nice creativity and the raw explosiveness to power his way through traffic. Like many young athletic slashers, Goodwin still has room to improve on the nuances of scoring in the half-court, be it learning how to read defenses, changing speeds and keeping his opponent off balance, or knowing when to stop and pull-up in the mid-range for an off the dribble jumper. He is just an average passer at this stage and is not immune to forcing the issue at times, but does not appear to be a selfish player and looks to have the instincts and smarts needed to develop a more complete offensive arsenal as he gains experience through good coaching. The area where Goodwin must improve the most as he makes the transition to playing against stronger competition is as a jump-shooter. He's capable of making spot-up jumpers (inconsistently) from behind the 3-point line, but doesn't show great mechanics and is very streaky shooting off the dribble. This will likely be a big factor in determining how good of a pro prospect he can become, as it's a major key to him developing into a more complete scorer. Defensively, Goodwin has a long ways to go, which is not a surprise considering his age and scoring prowess. His fundamentals are average at best, as he tends to stand very upright and reach excessively gambling for steals, rather than moving his feet and staying in front of his opponent. This is something he'll likely improve on considerably in his time at Kentucky under John Calipari, as he'll simply have to if he wants to get on the floor. Extremely young for his class, not turning 18 until August, Goodwin appears to be one of the most talented scorers in this class. He will be a player to watch over the course of his freshman season to see how he develops. If he can iron out the weaker parts of his game, he could draw some early interest from pro scouts.